Last night in Los Angeles at Milk Studios, celebrities gathered for the amfAR Inspiration Gala. It's her universe, we just live in it, okay? Okay! On to the red carpet. Brazilian model Ana Beatriz Barros — whom you may have seen posing in lingerie for Victoria's Secret or in a bikini in the Sports Illustrated Swimsuit Issue — wore a very pretty gown that makes me miss Downton Abbey. Jacki Weaver — who was a Best Supporting Actress nominee at the Oscars this year for Silver Linings Playbook — sparkled in obsidian sequins. Kelly Osbourne's red lace gown: Let's nix the bow in the back. Alessandra Ambrosio in Hugo Boss: SHINY. Lydia Hearst (actress, model, columnist, socialite, heiress, great-granddaughter of William Randolph Hearst) channeled a modern-day Guinevere. Goldie Hawn's Tadashi Shoji gown is light and frothy but better suited to springtime, no? Los Angeles knows no seasons, I guess. This red carpet had a lot of black ensembles. Mostly black. Comedian/TV host Chelsea Handler did it retro-cute; model/actress Devon Aoki went the inky slinky route. Zoe Saldana is gorgeous, but the lower half of this Marni dress is troublesome. Are the ruffles awkwardly situated? Is the hem too long? Something is not right. My word, Sharon Stone, as I live and breathe. This suit looks so great on her. 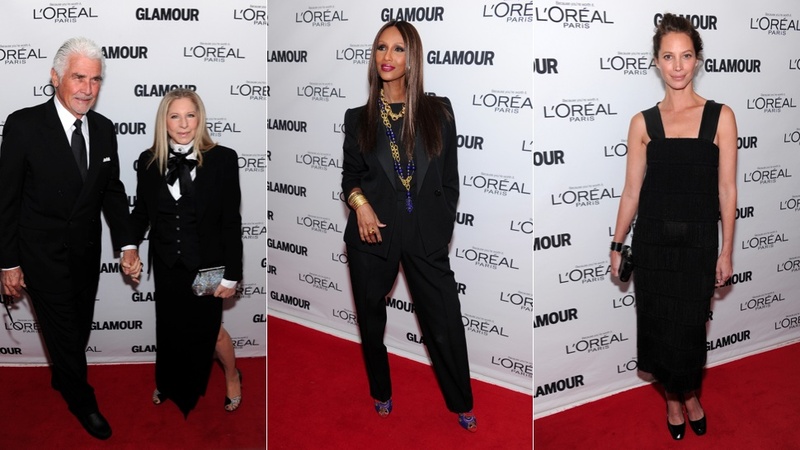 We've seen quite a few women in suits lately, including Miley Cyrus at the AMAs, Iman at the Glamour Women of the Year event and Rosie Huntington-Whiteley at the BFAs. Loving it. More black: Vanessa Hudgens bared her belly in a Hugo Boss cropped, tuxedo-inspired jacket and skirt with floral appliqués. The skirt might be slightly overwhelming? She looks fab, though. Hot damn, Paula Abdul's column dress and metal belt. Phenomenal. Never heard of Israeli actress/producer Moran Atias, but she looks stunning in a fluid, midnight-hued gown. Last but not least: Time to discuss the Issa London dress on Orange Is The New Black star Laura Prepon. That's a helluva lot of fabric. And yet! With her hair and eyes and the vivid color, there's something Liz Taylor-esque happening. On someone else this might be a disaster, but since it's so vibrant and different (so sick of sheer/illusion/net/lace) I'm gonna go ahead and say this is the best of the bunch. Kudos.